NOTES: One-year letterwinner ... All-PAC honoree ... 2015: Competed in all seven meets ... 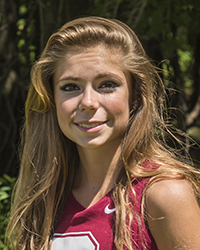 Team's top freshman and regular-member of top seven ... Season-best 6K time of 24:37.10 at Gettysburg ... Earned All-PAC Honorable Mention with 16th-place time of 25:23.0 at PAC Championship meet ... Finished 176th at NCAA Mideast Regional with time of 25:41.80. Class: Freshman Hometown: Pittsburgh, Pa.